Created in association with movie studio 20th Century Fox, Planet of the Apes is a 10 reel, 40 payline slot created by Net Entertainment. Available to play on all devices from 20p to £200, it comes with plenty of extras including transforming symbols and free spins with added wilds or multipliers. The set up in Planet of the Apes is a little unusual. The game is played on 2 different 5 reel, 20 payline reel sets. 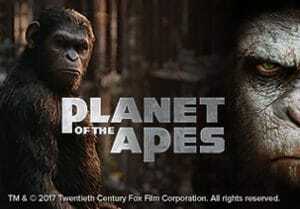 One is based on the Rise of the Planet of the Apes film, the other on Dawn of the Planet of the Apes. Both sets contain A to 10 playing cards, 3 human characters from the film and 2 apes. Rise Bonus feature - this is triggered by landing the Rise Bonus symbol on the first reel. Here you’ll receive an extra instant coin win on all human and ape symbols with up to 79.5 times your total bet available. Dawn Bonus feature - you’ll get this by landing the Dawn Bonus symbol on the far-right reel. All of the human and ape symbols on the Dawn side of the reels transform into the same matching symbol. This can lead to maximum wins, as in the base game, of 1,200 times your total bet. Dual feature - if this is triggered, 1 symbol on each side is chosen. If that symbols lands on its chosen side, it locks in place. If the matching symbol lands on the other side, it transfers to the other play area. Re-spins keep on coming as long as the chosen symbol lands. A payout is made with all the locked symbols in place. Rise Free Spins feature - land 3 or more scatters on the Rise side and you’ll receive 10 free spins. Any wilds that land during these free spins are collected then dropped into play on the final super spin. Dawn Free Spins feature - you’ll receive 15 free spins if you land 3 scatters on the Dawn playing area. There are 3 extras on offer here: multiplier, extra wild, extra free spins. Collect the appropriate symbol, fill the meter and you’ll receive that extra. You can increase the multiplier up to 5x, get 3 free spins each time and extra wilds – this is the most lucrative of the bonus features naturally. Multiple Free Spins feature – if you get 3 scatters on both areas, you will play both the Rise Free Spins feature and Dawn Free Spins feature one after another. As you’d expect from a Net Entertainment movie tie-in, the design here is very good. The reels contain imagery from the 2 films which is very crisp and clear. The 2 reel sets take a little getting used to - once you have got accustomed to the unusual set-up, there’s plenty to like here, especially if you enjoy a good variety of features in your play. The recent re-boots breathed new life into the Planet of the Apes franchise. With its high-spec design and range of extras, the slot game version does much the same. It’s medium to high variance with maximum wins of 3,000 times your total stake on each Dawn Free Spin (due to the 5x multiplier). If you like slot games based on movies, Jurassic World by Microgaming and RoboCop by Playtech are recommended.